Hey, y'all! I feel like it's been forever since I've posted, even though my last post was only last Wednesday. Maybe it's because I've started and finished a new quilt without even giving you a glimpse of it (sorry!). Yesterday I finished a quilt that was really a struggle for me- an entirely low volume quilt made with fabrics that I don't love at all. I purchased these fabrics over five years ago, thinking that they would make a pretty baby quilt. At that time, shabby chic decor was all the rage and plenty of people used pastels when decorating nurseries. Unfortunately, not long after, I hurt my wrist and had to have surgery, surrounded by a long quilting hiatus. Well, a LOT changed during that break. Fabrics with bolder, more saturated colors came out and really took over the modern quilting movement. Since that time, this bundle of fabric has just sat in my cabinet, taunting me and daring me to put it into a quilt. I decided that I just couldn't look at it any longer and needed it out of my stash. So, I made a giant log cabin with THIS method, knowing that it would be a quick way to put these fabrics to use. Because the colors are so soft, the backing fabric was a little bit tricky to find. At first, I thought the colors were simple baby pink, baby blue, soft green, and lavender, but when I went to find a backing fabric, I had a much harder time getting just the right shade. I realized that the hues are more subtle than I thought. The pink is really more of a blush, and the blue is really a very soft aqua. What I thought was lavender is actually a periwinkle color, and the green is the softest shade of sage. I'm thinking that if the colors were just a little bit more saturated, or maybe not all used together, I would like them better. I ended up using a soft sage tiny polkadot fabric on the backing and a shade of aqua for the binding. 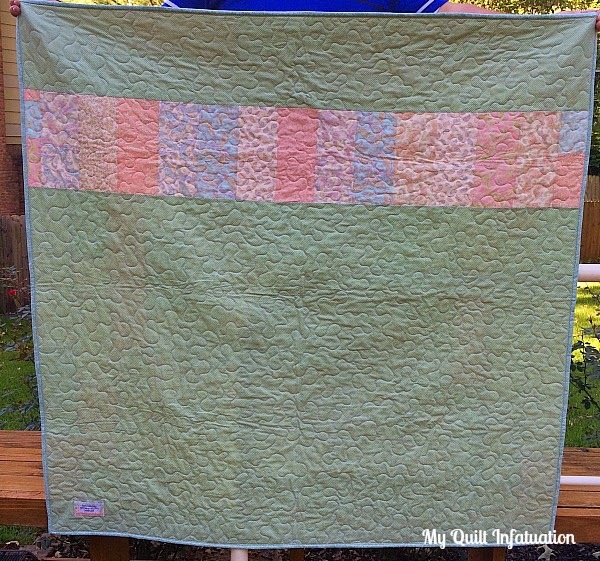 Overall, the quilt has a lot of the blush color, and I really didn't want to add more. Incidentally, I do think it looks better against the white iron bed. This bed actually came from my great grandfather, and we are repainting it navy for my wild thing. It was sitting in my garage, and I thought it would make a nice prop for this quilt! I still think that even though this quilt is not my style at ALL, that it will make a very sweet quilt for a brand new baby girl. Thanks for sharing a quick piecing method. I'm sure there are parents who prefer sweet soft shades in nursery decor. All those fabrics and the backing blend very well. 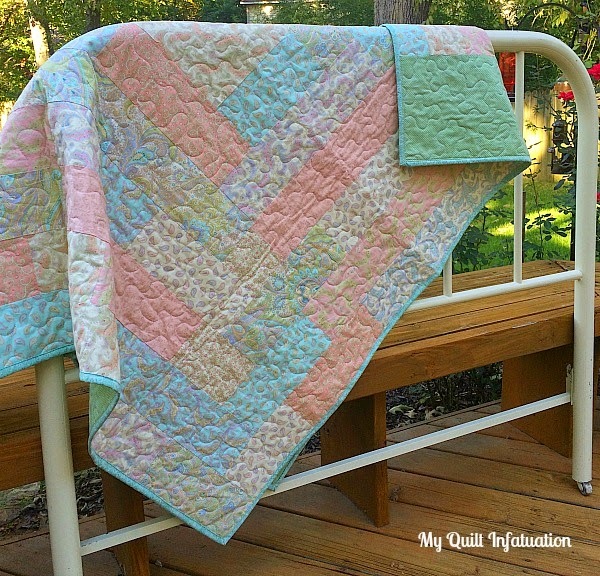 The log cabin pattern you used is perfect for the fabric. 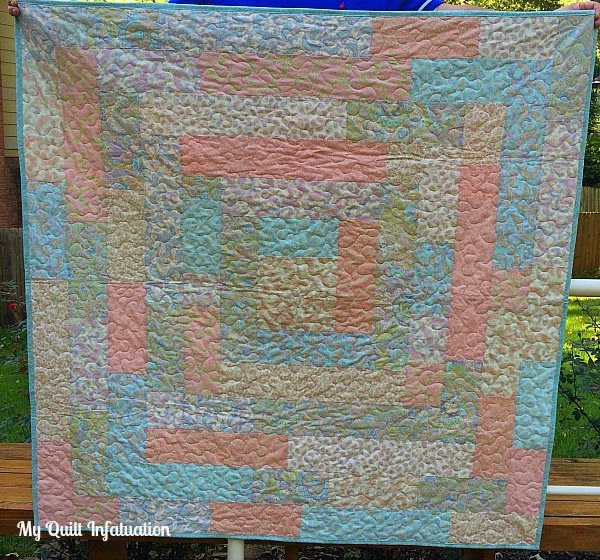 I have made a quilt using your tutorial, and it did sell! I'm with you on the fabric but I LOVE this pattern so much!!!! I've never done a log cabin anything before how do you decide the size of the center block with regards to the strip width? This is such a sweet baby quilt! I love that you used the log cabin pattern. 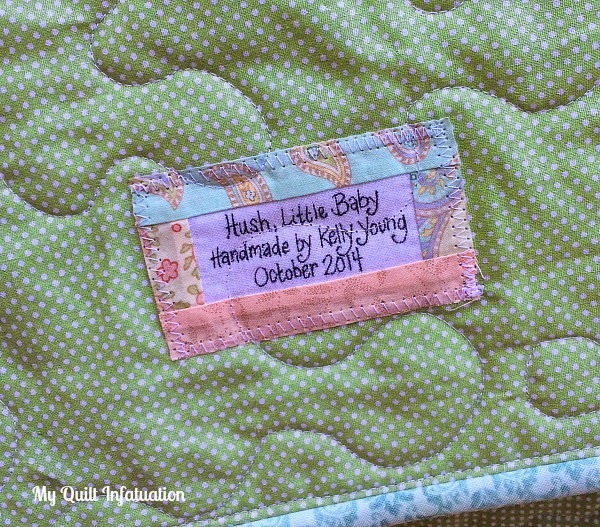 Ha ha yes it's not a quilt that screams "I'm a Kelly" but it's lovely nonetheless!!! Doesn't it feel GOOD? I think we all have some stash that once either spoke to us or we thought it might someday! And to be able to create (a really wonderful quilt) and move on! A wonderful gift and a wonderful cleansing of the soul! A win-win I say! It will ake a mom very happy. You sure do nice stipple too! It's a sweet quilt and will be loved. I'm glad you plugged through and made this quilt despite not being thrilled with the fabrics anymore. Love the fitting name you chose for it. Thank you for sharing your tutorial for it. Feels good to use it up I bet! At least it won't be taunting you any longer.... hate it when that happens! 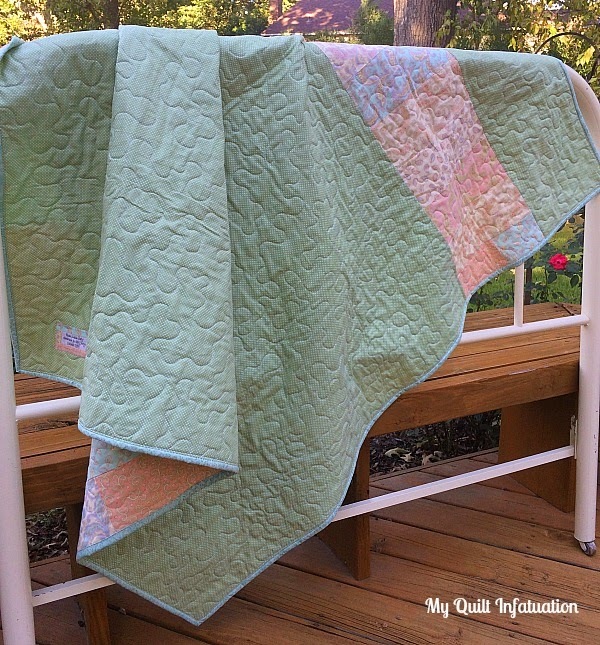 Love the quick easy pattern to make your little quilt. It will still keep a little one warm, and that the most important part. !